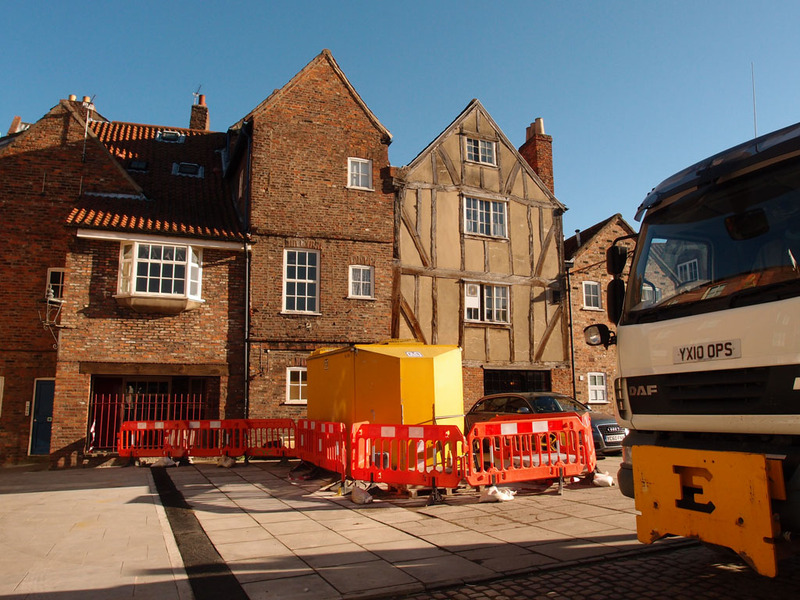 ‘Some of the paving is cracked already’ is one of the complaints about the new ‘Shambles Market‘. I thought I’d wade into this (being careful not to trip). Do we mean here? The paving to the right of this photo, by the lorry, is, as far as I can see, the same paving as it was before the work started. That is, old, not new. Earlier photos show there were already a few cracked slabs. This photo shows that there are more cracked slabs. This is perhaps because this area, being older paving, has been used to park on/dump heavy stuff on. Maybe someone nearer who saw the work on a daily basis can confirm. Perhaps the plan was to replace these last. But everything’s taken longer than expected. Doesn’t it always. Next to the cracked old bit, in this photo taken earlier this month, there are some new slabs, then there’s some temporary tarmac patching, then some more new paving. In front of it are the stone setts, also I think there before and not replaced. I had a wander through yesterday, and admittedly it was dusk by then, and I didn’t crawl about on my hands and knees under the market stalls, but these cracked slabs were the only cracked slabs I could see. If you know otherwise, please add a comment. Elsewhere, particularly along the new and rather wider ‘avenue’ between the run of stalls, the paving is really very nice. Looks to be the same stone slabs used in King’s Square. 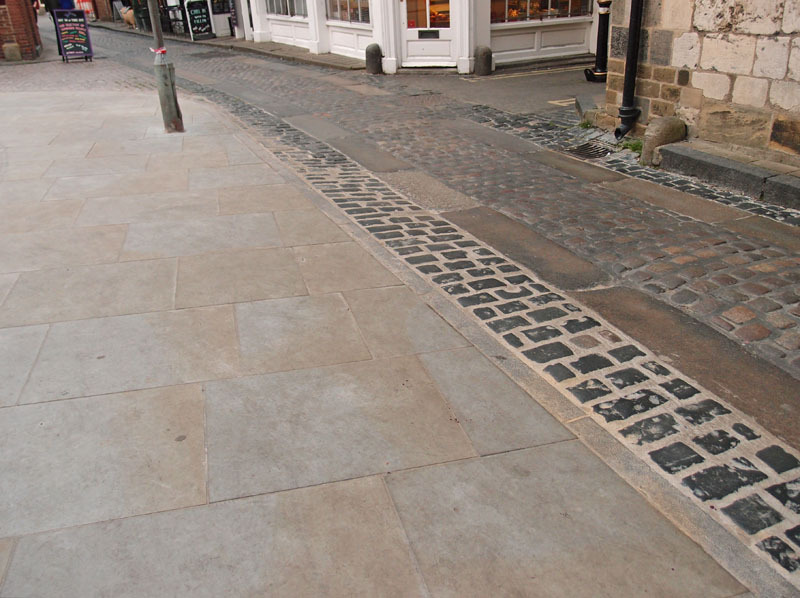 The paving appears to be another successful mix of old and new, as we saw at the edge of the King’s Square work, where they ended up leaving more of the old cart tracks and setts than it appeared they intended to originally. Here in the market area, and assuming that they’re not going to rip it all up later, it seems that they’ve decided to keep a lot of the old setts on the ‘road’ parts. Which makes complete sense, and shows evidence of listening to public concerns. Isn’t that nice. As illustrated here, more clearly. A section of new paving right at the edge of the reinvigoration zone, on Newgate itself. It’s the area following on from the photo at the top of the page, to the left of that. There’s a section of the new slabs, neatly joining those old cart tracks and setts we demonstrated concerns about in King’s Square. They daren’t touch the cart tracks and setts in case Michelle hears about it. 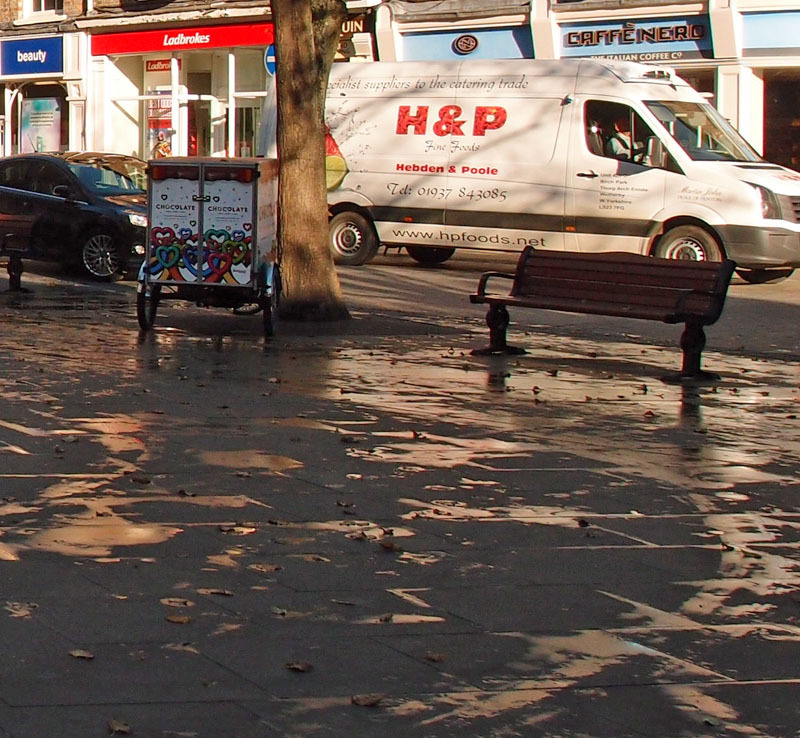 While we’re on the subject of paving, let’s have a wander into nearby King’s Square. Have a seat here on Paul Woosey’s bench, and please listen carefully as I provide a Public Safety Announcement. One morning a couple of weeks back I went to sit in King’s Square to do some traffic-watching (more on that story later) and people watching and general city centre sunny morning appreciating, on my way to buy some veg from the market. And took a few photos, like that one. You’re probably looking at the nice blue sky, the Minster, maybe the man in his nice hat in the centre, maybe that big green van. Maybe that massive great clunking box on a trike thing Chocolate Story are still plonking by the tree in the square even though so many people think they shouldn’t. Can I draw your attention instead to the smooth new paving to the right, which as you can see is wet in parts. There are also a few fallen leaves. If you ever see this combination of things, slow down and tread carefully. Avoid the leaves, avoid the area entirely if you can. When the old/new paving in this square was being hotly debated last year I said I couldn’t really see how all the alleged falling over on paving was occurring. Some said the old paving was a hazard. When the new paving went in other people said that would be a hazard. I couldn’t really see any of these hazards, until this particular morning when a woman fell over in the square right in front of me. I’d been thinking what a lovely city scene it all was, when the woman, walking across that bit of the square perfectly normally was suddenly lying on the floor. Only briefly, thankfully. She got up pretty sharpish. People nearby gathered round and checked she was okay. She wasn’t frail and elderly, she was probably in her fifties. She’d been striding along confidently when, I assume, she’d trodden on a wet leaf on that smooth natural stone. Because she slid, rather than tripping. Quite unlucky, as there were only a few leaves about for her to slip on. 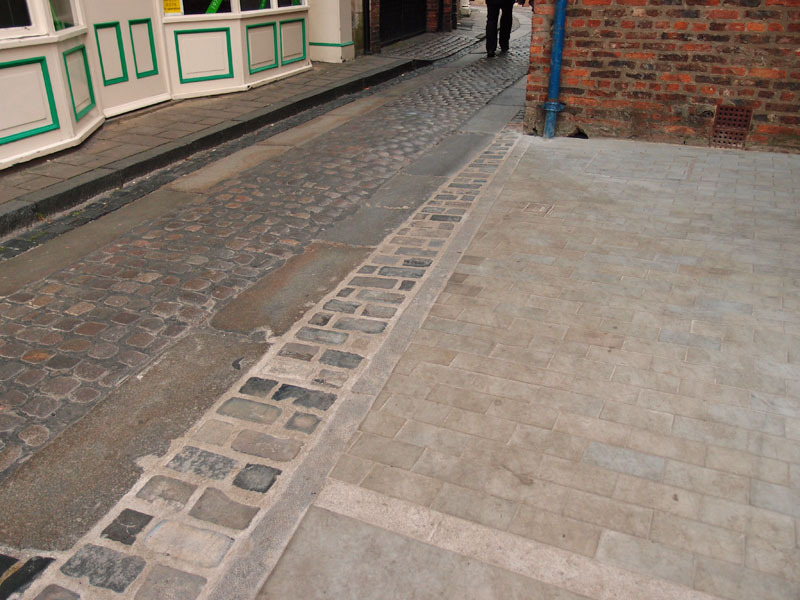 I thought about mentioning it on Twitter at the time, but then in the current mood, and with so many people so annoyed at the King’s Square changes, I wasn’t sure I could cope with it if it all kicked off into ‘I told you so’ paving-related debate. I’m mentioning it now because it’s that time of the year when there are a lot of leaves about, and because it made me think about ‘hazards’ in the urban environment, and whose fault it is if we fall. We could blame the trees, couldn’t we. Being messy, that thing they do of dropping their leaves. We could blame the council for not sweeping all the areas near trees twice daily in the autumn. We could blame the council for putting down that classy but clearly extremely smooth paving rather than more practical rugged tarmac or concrete or something. The other factor, of course, is shoes. As I know from a slight slidey-not-quite-falling-over-but-looking-a-bit-silly incident on Bootham, with a similar combination of wet leaves on natural stone (old stone in this case, just pointing that out, it isn’t just new and expensive King’s Square paving where this occurs). I was wearing not my usual rugged-treaded footwear but something more like a traditional women’s winter boot. With not much of a tread. I expect there are more slipping incidents involving women, because of women’s more generally dainty and smooth-soled shoes. So, ladies in particular, watch your step. 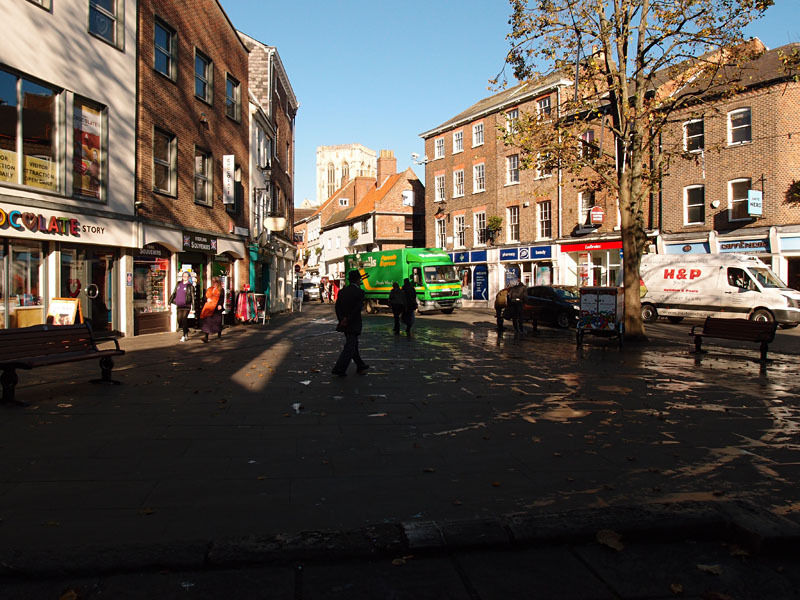 We don’t want any more people falling in King’s Square or indeed anywhere, or we might end up blaming the trees and chopping even more of them down than we do already. More on that story later. After that rest on Paul Woosey’s bench, time to wander off to something exciting nearby. Mind those leaves.